The men’s swim team has not started off the season the way they had hoped to. So far, they have a 0-6 record in dual meets, but they are a young team that is working every morning and every day after school to improve. 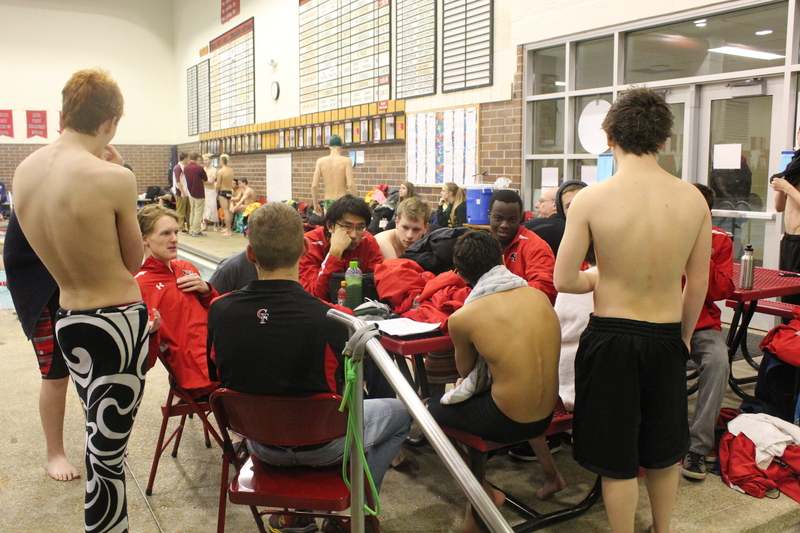 The team huddles during a recent meet. Photo by Kylee Ferrell. swimmers improved their times by four to eight seconds. All of the team’s veteran swimmers have also gotten or met their personal records this season. “With such a youthful squad, this season our main goal was improvement. They have spent hours upon hours in the mornings, nights and weekends training. We have made great strides because of this. This is exciting because we have yet to start resting for our fastest swims of the season,” head coach Joe Brown said. The swim team practices every morning and every day after school. On Mondays, Wednesdays and Fridays they swim in the morning from 5:45 to 6:45, and then in the afternoon from 4 to 6. On Tuesdays and Thursdays they lift in the mornings and swim at night. Not only does the team practice twice on each weekday, they also practice on Saturday mornings if they do not have a meet. “Each member wants to be there and improve. My favorite part has been watching those improvements. The improvements made have justified the long practices, early mornings and enormous commitment they have made since early November,” Brown said. This year the team has three seniors: Daniel Reinart, Max Su and Joe Kosmicki. “I am going to miss all the friends and experiences that I had on the team,” Reinart said. The seniors have brought a lot to the team and are still improving their times. “All of our veterans have really stepped up. They did not have much choice. They knew I was going need a lot of help in order for all of the brand new swimmers to be successful. There are a lot aspects of a swim meet to understand, rules to follow and techniques to learn. The upperclassmen have provided rides, proper work ethic and much more for the non-veteran swimmers,” Brown said.